On Saturday February 9, the Buffalo Bandits (7-2) headed down south to take on their Eastern Division Rivals the Georgia Swarm (7-3) during Native American night and they dominated the Swarm on their home floor. The attendance was actually very high for this game with 7,767 Swarm fans on hand who have averaged 5,173 fans per game, the lowest in the league. Final Score: Bandits 19—Swarm 9. Defender Steve Priolo (2G, 1A) showed off some offensive skills and got the Bandits on the board first. Thomas Hoggarth (3G, 1A); and Corey Small (5G, 2A) would also score in the first while the defense held the Swarm scoreless after one. Score 3-0 in favor of Buffalo. The teams would combine for a total of 10 goals in the frame with Connor Sellars (1G) a Swarm defender getting Georgia on the board first. About four minutes later Priolo got his second of the game and the Bandits were up 4-1. Zed Williams (2G) got two goals in the second; as well as Lyle Thompson (1G, 3A) but that would be it for the Swarm after two. The Bandits would see goals from Small; Ian MacKay (1G, 2A); Matt Spanger (1G, 2A); and Chase Fraser (2G, 2A). The Bandits had a decisive lead 9-4 at the half. 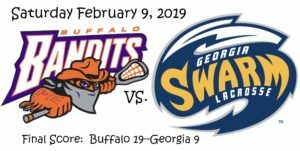 It was the Bandits show again in the third as they outscored the Swarm 6-1 with Hoggarth; Small and Shawn Evans (4G, 6A) dominating the Swarm defense in the third. The lone goal for Georgia came at the hands of Shayne Jackson (2G, 2A) on the power play, and the Bandits were out to a 15-5 lead. The Swarm would slow down the Bandits only allowing four goals in the fourth while scoring four of their own. Buffalo would start and end the frame with power play goals by Evans; Jordan Durston (1G, 1A) would get on the board; and Fraser would notch another. Scoring for Georgia was Jordan MacIntosh (1G, 1A); Miles Thompson (1G, 1A); Jerome Thompson (1G, 1A); and Jackson. Final Score: Buffalo 19—Georgia 9. Hoggarth finished the night with three goals and one assist; Small five goals and two assists; Evans with four goals and six assists. Dhane Smith may not have scored a goal but still had 11 points all assists. Chase Fraser had two goals and two assists; Priolo two goals and one assist; Ian MacKay and Matt Spanger each had three points. ; and Jordan Durston had two points of his own. Matt Vinc made 34 saves and has played great so far in Buffalo with a fast young defense in front of him. For Georgia Mike Poulin made 32 saves while young goalie Kevin Orleman made 17. Buffalo was solid with 70 shots on goal in this game. This was Georgia’s third loss of the season and the win could put Buffalo first in the East. With a 7-2 record they are one of the favorites to make a championship run come playoff time. On a side note Buffalo made a trade this week signing the 2018 second overall pick, Chris Cloutier from the Philadelphia Wings for defender Ryan Wagner. The Kitchener Ontario native and former UNC Tar Hill should add to this power offense and be a solid lefty. This offense was also without lefty-forward Josh Byrne who has been hurt. Buffalo (7-2) will head west and across the border into Calgary to face the Roughnecks (5-4) on Saturday February 16, game time 7:30 p.m. EST. Georgia (7-3) heads to Colorado to face the Mammoth (2-5) on Saturday February 16, game time 9:00 p.m. EST.